Emily has held a passion for cardiology since qualifying from Edinburgh University in 1999. 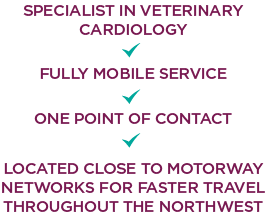 After obtaining the certificate in veterinary cardiology in 2003 from general practice, Emily began working exclusively as a veterinary cardiologist in 2006. In 2014, she was awarded the RCVS diploma in veterinary cardiology followed by RCVS specialist status in veterinary cardiology in 2016. Emily enjoys all aspects of feline and canine cardiology, but is particularly interested in arrhythmias, collapse, biomarkers and echocardiography. Emily is currently a member of the heart testing panel and has been elected joint secretary of the Veterinary Cardiovascular Society. Cheshire Cardiology shared a post. Cheshire Cardiology shared a photo.